I am happy to announce a new website project, following several months of development: Jotpub.com, titled Minimalistic Language Tests Platform. Jotpub is a website that enables anyone, from most modern devices, to solve, create, and share language tests, see the score and keep track of the solved tests — for free. The purpose of Jotpub is to be a simple, creative, open, non-obstructive and trusted solution for language practice by online tests. It is simplistic in design and idea — there are too many complex learning platforms and Jotpub is not trying to be one. It is open, so all interested visitors can solve tests and check their answers, and thus non-obstructive. It encourages creativity by giving an opportunity to all registered users (the registration is free and necessary so tests could have an author) to make and share tests. “Trusted” means that the author (and the editor) pays close attention to the sources of the selected tests and texts, and that only checked, reliable, content is visible to learners. All in all, Jotpub an attempt to reach, educate, and help language learners (an their teachers). And, yes, it’s free. Main features of Jotpub are focused on solving, creating, and sharing language tests. 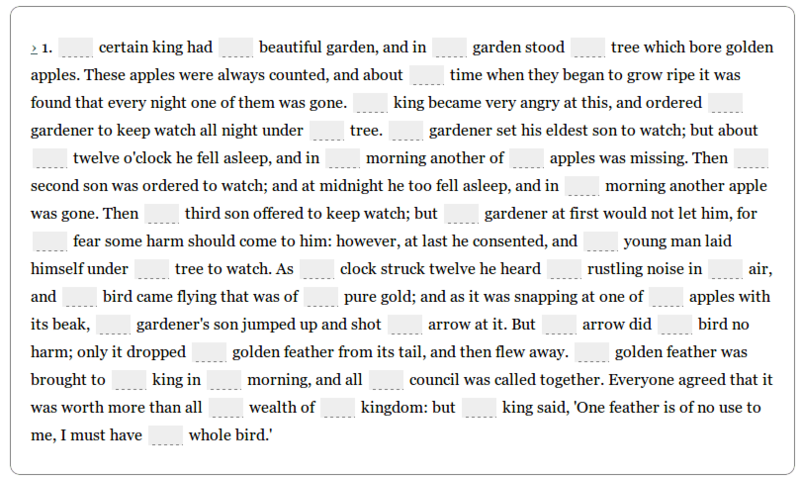 Solving is based on entering, checking, and revealing answers to “traditional” questions: fill in the blanks, true/false and multiple, with either one or several correct answers — try solving The Indefinite Article Basics or Articles from “Golden Bird” (a lengthy one). Creating is done on the website on a special page (Jotpub Test Maker) that uses a simple interface to create new language tests. Sharing is made possible by publishing a page address (for now by using a third-party solution), and all authors can share the link to their tests. The language test are organized into two main groups: by categories and tags. The categories follow a strict linguistic division, for example Grammar > Articles > All articles, while tags represent more loose, mixed, labeling (in the tag listings, the categories are tags as well). Users can browse the tests and then select one to solve. After entering the answers and clicking on Check my answers, the analysed test will appear, showing correct, incorrect and missing answers. Users can now redo the test, or reveal the answers (this option is available only when tests are first attempted). If users are registered, their test is saved in Testbook, so they can redo it later. Also, each listing has small symbols that show solved and attempted tests. Jotpub has a nice printing style and only the relevant information for test solving is shown on the paper. You can copy it and share to your learners. You can also print solved tests. Jotpub Test Maker – an example of creating a multiple select question. The test creation is done in the Jotpub Test Maker — the page anyone can use, and the one I use to make all tests on Jotpub. After users register, they will be able to load the Test Maker and enter their questions. Great attention was given to an attempt to make this as simple as possible. For example, to make a blank, just enter the sentence and enclose any word (or a letter) in square brackets ([like this]); for multiple select either one or several answers — this will render two types of questions. The test are at first unlisted. This means they are not available to all users. After the test is checked it may be listed and visible to all visitors. However, all created tests can be shared if the test creator shares a link to it. There are several plans regarding the future development of Jotpub. Some are focused on stability and optimization, and others on new features (particularly about statistics). For now, the primary task is to see what users think abut the website, and what they would like to see changed, improved or added. You are invited to be one of the visitors to solve some tests!